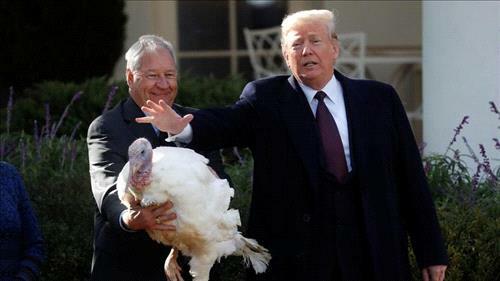 AMMONNEWS - In an annual Thanksgiving tradition, President Donald Trump used the power of his office Tuesday to keep a pair of turkeys off the holiday table. “This was a fair election,” joked the president, whose wife, first lady Melania Trump, was on hand to witness the act of mercy carried out during a ceremony in the White House Rose Garden. “I have warned them that House Democrats are likely to issue them both subpoenas,” he said. “Unfortunately, I can’t guarantee that your pardons won’t be enjoined by the Ninth Circuit.” That was a reference to the San Francisco-based federal appeals court that has overturned some of Trump’s actions.